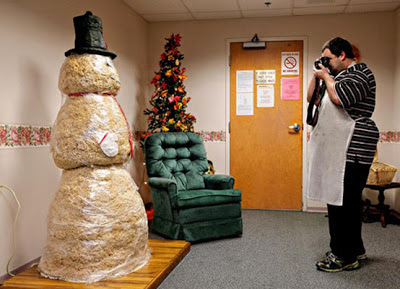 The World's Only Online Snowman Magazine: That's one sweet Snowman: 364 lb marshmellow, butter, cereal snowman up for auction! That's one sweet Snowman: 364 lb marshmellow, butter, cereal snowman up for auction! In Deerfield, NH, a soon-to-be- raffled 5-foot-5, 364-pound holiday treat snowman named Mr. Red is currently residing in the lobby at the Inn at Deerfield, a facility for people suffering from or nearing dementia. Mr. Red's name is in honor of his sponsor, the Manchester’s Red Oak Apartment Homes. The money raised through the raffle will go toward the resident activity fund, which sponsors activities for the 32 residents (ages 55 - 93) - trips to the movies, shopping, having local musicians coming by to entertain at the center, picnics, blueberry picking, gardening and more. You can read more about this project at the Concord Monitor online.